The horse and buggy business has become a staple attraction of the cruise tourism industry in Belize City, and on days when cruise tourists come to our shores, the horse-and-carriages can be seen weaving through traffic, pulling groups of tourists to-and-fro all across the city. That practice, though, has now come under scrutiny after a 10-wheeler truck ran over the leg of a horse that was pulling some tourists in a carriage this past Tuesday at the corner of Craig and Daly Streets. The horse, called Jack, sustained a broken leg and had to be subsequently euthanized, to the ire of animal enthusiasts who have long been complaining that the horses are sometimes treated inhumanely because they work long hours and normally have to compete with buses, taxis and other vehicles in heavy traffic. Many of those complaints have been forwarded to the office of Belize City Mayor Darrell Bradley, and he told the media that City Hall – which governs the allocation of trade licenses for operators – is very aware of the concerns, especially since only one out of the four operators is eligible to do business in the city. Bradley said, “There has been interests and concerns raised by members of our community as it relates to the human treatment of these animals and the sanitary operation of this type of business, and it is something that we were very concerned with. There is a standing committee which comprises of members of the Belize City Council, the horse and carriage operators and members of the BTB who try to resolve some of these things. 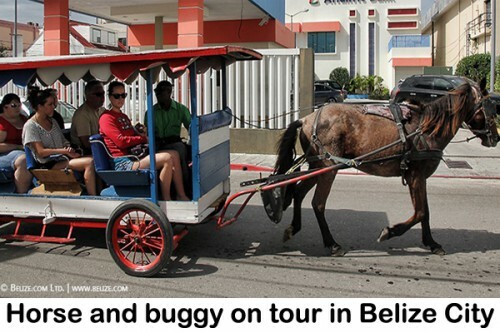 So while the City Council is responsible for issuing trade licenses, the Belize Tourism Board (BTB) is responsible for ensuring that horse and buggy operations apply health and safety standards for tourists, and take disciplinary action against those businesses that don’t follow the rules and regulations. According to the BTB, the accident is currently under investigation, while the driver of the truck, Josue Garcia, has since been served with a Notice of Intended Prosecution pending investigations.